Can you survive the Betrayal at the House on the Hill? 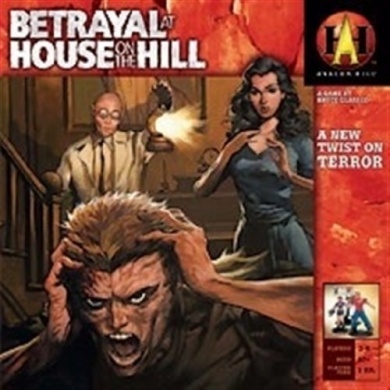 Cover art for the Betrayal at the House on the Hill. Credit: Avalon Hill. Betrayal at the House on the Hill is a collaborative board game in which players explore an ancient house on a lonely hill, seeking to unlock its secrets … and its horrors. It’s a dynamic game whose map is randomly generated each game using a series of tiles representing the basement, first floor and second floor of the house, with a new tile drawn every time a player enters a new room. Players take on the role of one of several adventurers tasked with exploring this haunted house. Each adventurer is represented by a stat card representing key abilities such as speed, strength and will. Different adventurers have different strengths — the preacher is strong in will but weak in physical abilities, while the boy explorer has a high speed, but low willpower. The players quickly begin exploring the house, an act that will inevitably bring about their doom. Each time they enter a new room, an omen card is drawn. This causes some supernatural event to occur … and which may provide the player with bane or benefit. After drawing an omen card, players must roll dice to determine if the game’s namesake betrayal occurs as the evil in the house overwhelms their character. If the total rolled is greater than the number of omen cards in play, nothing happens. If it is less, then the evil awakens. Exactly which evil awakens depends on certain pre-set conditions (tiles in player, characters in the game, etc.). To determine exactly what’s happening, the players consult two books. The first, for the betrayer, explains what when wrong and one terrible conditions now exist in the house … as well as what monsters are now the traitor’s to command. The other tells the surviving adventurers what they must do to either put things right or escape from the house. The conditions are different each time, and with four dozen or so scenarios its unlikely you’ll see a repeat one anytime soon. I picked up this game cheap at the mall gaming store, and while it hasn’t become one of my group’s staple board games like Settlers of Catan, Risk 2210 or Arkham Horror, it is one that we pull out every few months when we need a change of pace. The collaborative nature of the game is appealing to us, as is the fact that it can be played quickly (unlike our other big collaborative game, Arkham Horror, which is anything but quick). Games last 30 to 60 minutes, and rarely go over an hour. It has good production values with quality plastic and sturdy cardboard pieces, although the cards did feel a bit sticky to the touch. Setup time was 5-10 minutes (which is another big difference from Arkham Horror, which can take 20-30 minutes to setup depending on how many sets you’ve got in play,). Another point in the game’s favor is that it’s one of the few games I own that can be played with three players, which makes it great for those Game Days when our regular D&D or Star Wars campaign doesn’t go off because of too few players. On the downside, games can be over too quickly — we’ve heard of people finishing a game in 10 minutes when the haunt was revealed on the third turn thanks to some incredibly bad rolling. On a geek parenting note, the game’s not suitable for young children – heck, they shouldn’t even be in the same room when you play it. This is a game of murder, horror and mayhem, and it’s nothing you’d want little kids around. In theory kids 10 and up can play it, but in truth this is a function of their maturity and ability to handle adult themes. If you’ve watched a few horror movies with them, and they get the tropes of the genre, then it could be a good geeky family game, but if not, go with Settlers or something similarly benign.